On May 19, 2019, the Hillsdale Police Department in conjunction with the Hillsdale PBA will be hosting its 3rd annual Cops and Bobbers® fishing derby at the Woodcliff Lake reservoir located on Reservoir Road in Hillsdale. 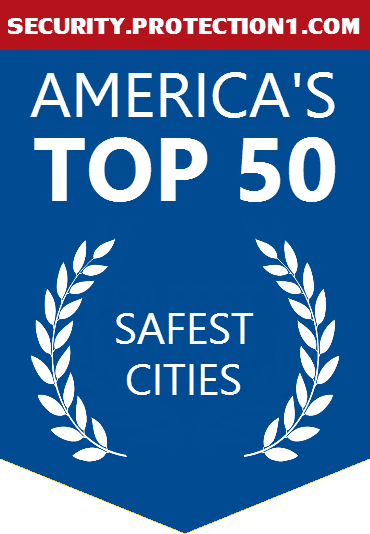 The event will start at 10:00 a.m. and go until 2:00 p.m. There is no registration required for the event. Show up, drop your line and catch a fish! The Hillsdale Police Department will use fishing as a tool to connect police officers and the youth of their communities. Officers will work side by side with kids, helping them bait, cast, hook and release fish all while bonding and learning that they are not so different from each other after all. Fishing teaches patience, ingenuity, preparation, and humility. It is an activity almost anyone can do and afford. In the Cops & Bobbers program, cops and kids work and fish together which makes every day a good day. During the day NJ Department of Environmental Protection’s Game Wardens will provide demonstrations and education to any and all participants. Also, NJDEP will be providing their Hooked on Fishing, Not on Drugs trailer which contains fishing equipment to loan to those that have never fished before or are in need of equipment. Any questions can be directed to P.O. Ryan Norton at RNorton@hillsdalepolice.com. The Hillsdale Police Department is pleased to announce that our next Coffee with a Cop event will be held on May 11th 2019 at the Kings Supermarket in Hillsdale. Coffee with a Cop is a community policing program focused on meeting with the community to discuss any community concerns you may have. 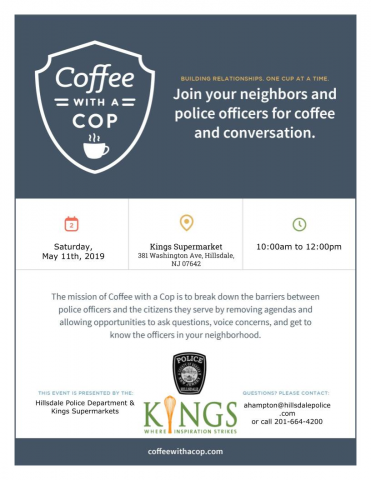 Chief Francaviglia would like to thank the Kings Supermarket for sponsoring our event and donating coffee and snacks for our community members.